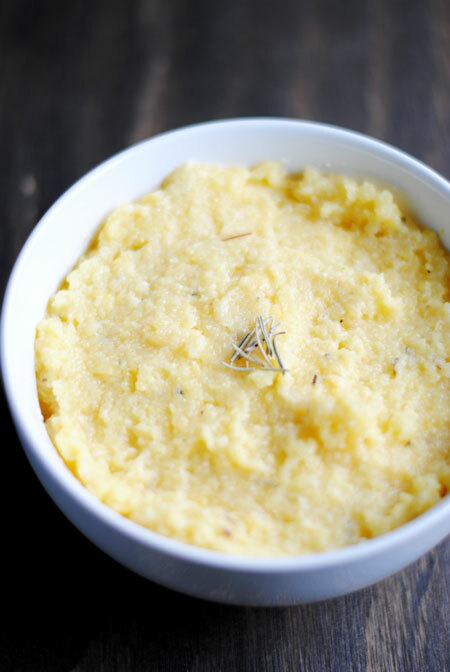 Look at that simple bowl of polenta. Unassuming, nothing fancy, but oh how your eyes can deceive you! 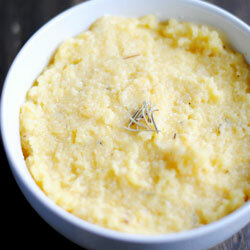 This Rosemary Parmesan Polenta is one of those dishes that I want to faceplant in and eat my way out. Yes, to all zee carbzzz! I served this with the Sausage, Cannellini, and Tomato Ragout and together…sweet, sweet harmony. Plus they don’t blow our your calorie budget. You can have both! 1. Bring water to a boil in a medium saucepan over medium heat. Gradually add polenta, stirring constantly. 2. Reduce heat to low, and cook 3 minutes or until thickened, stirring frequently. 3. Remove pan from heat. Stir in Parmesan cheese, yogurt, rosemary, and salt.